Shopping in the narrow antique allies of Korea, eating loads of fabulous Korean food, camping in the Rocky mountains of Colorado, riding horse, fishing rainbow trouts, hang-out with families…, these are some of the wonderful things I had this past summer. I spent very good time both in Korea and U.S last month, but no matter how much fun I have in any exciting places, I always recite the same praise at the end of the trips, ‘there is no place like home’. I am happy to be back home, my sweet home! 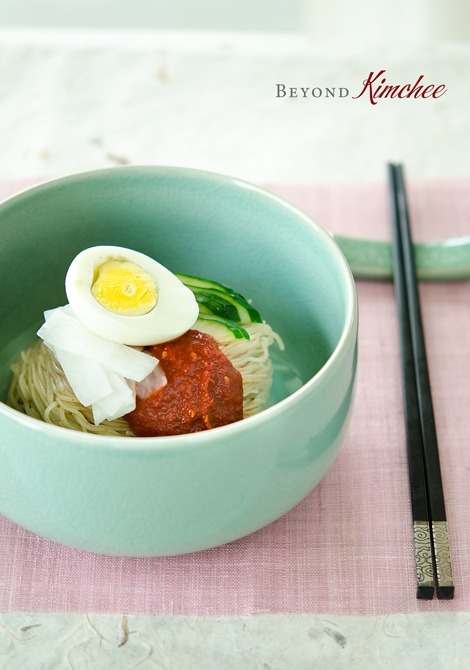 Upon my return from the summer break I would like to treat you with a very cool summer noodle dish of Korea; “Naengmyeon“, the Korean Cold Noodles. There are two kinds. One with spicy sauce that you mix together (Bibim Naengmyeon), and the other one with icy broth (Mool Naengmyeon). They both are popular noodles to be eaten during hot summer season in Korea. Today I am going to share with you the Bibim Naengmyeon. This is Korean Naengmyeon (somewhat similar to soba). These noodles are made with buckwheat flour. However, they are not solely made with 100% buckwheat though. They will have some wheat flour added, because noodles made with only buckwheat will break so easily (They won’t hold their shape). 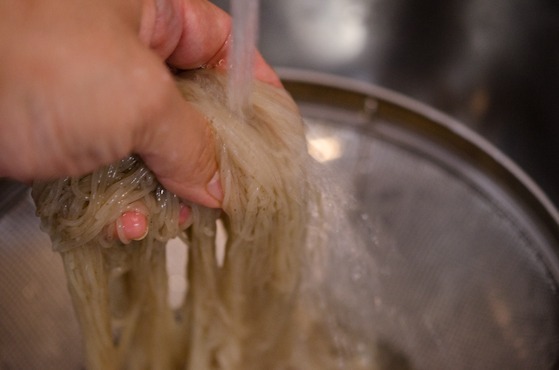 Korean buckwheaat noodles contains more of sweet potato starch and wheat flour than Japanese soba, which creates chewier texture to the bite. Although buckwheat is gluten free, if you are looking for gluten free buckwheat noodles, read the ingredients on the package just to make sure. Not every buckwheat noodle is created equal. The color varies depends on types of buckwheat as well. The darker the color, the more of outer skin of buckwheat are used. There is nothing that can be disappointing than having bad Naengmyeon with terrible sauce. Good Korean Naengmyeon has to comes with good sauce. I will share with you a wonderful recipe. Don’t be scared by the list of all the ingredients. 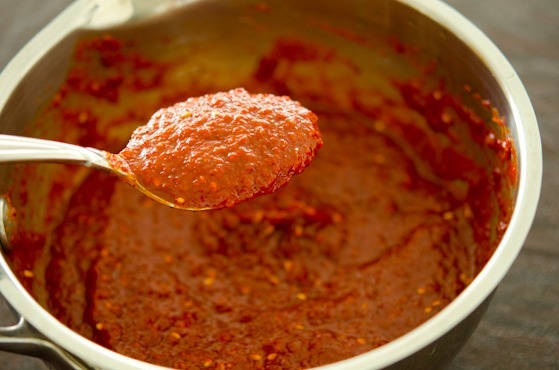 You can whip up this sauce quite fast, but it needs to be prepared ahead of time to chill, 1-2 days ahead, so that the flavor will incorporate and mature. Get ready for the spicy paradise!!! This is how Koreans fight the heat of scorching summer. These devoted crew are ready to work. 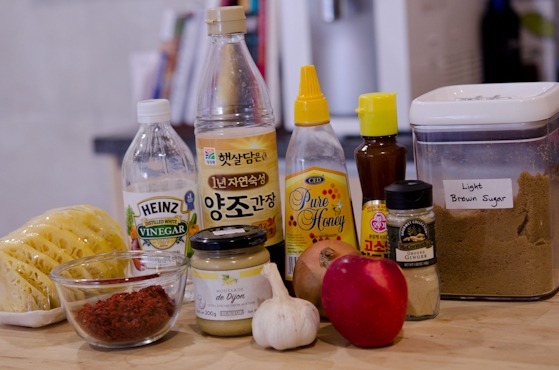 Pineapple (either fresh or canned), vinegar, soy sauce, honey, sesame oil, brown sugar, Korean chili flakes, Dijon mustard (or Korean mustard), onion, powdered ginger, garlic, and apple. 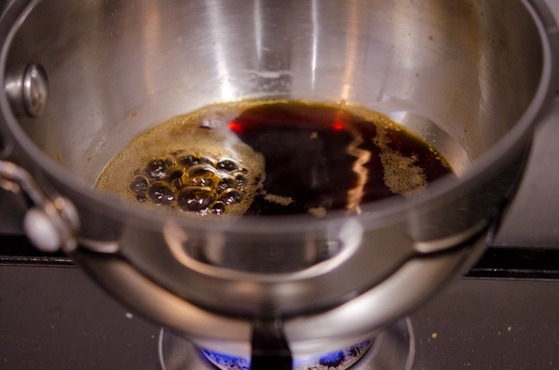 First, mix 1/2 cup water with 1/4 cup soy sauce and bring to quick boil. Remove from the heat and set aside to cool. 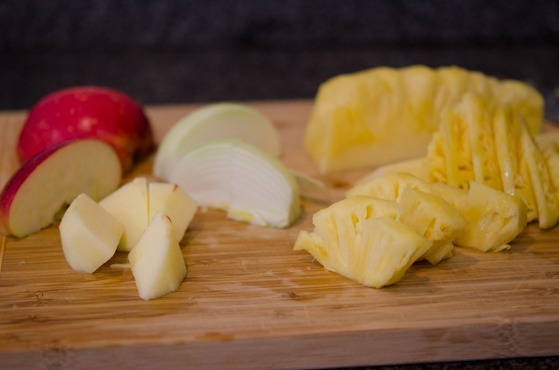 Dice apple, onion, and pineapple. I used fresh pineapple but you can use canned. You only need about 3 slices. Dice a piece of garlic, too. 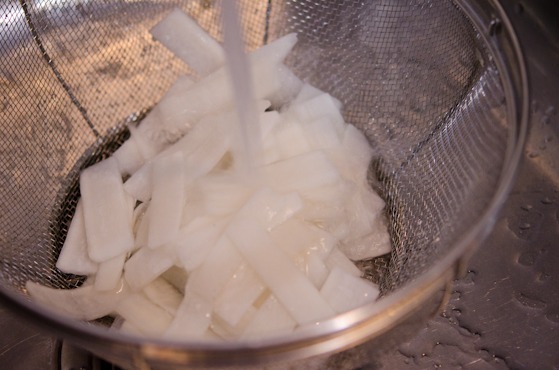 Put them in a blender and process until velvety smooth. You can add a little bit of water or pineapple juice (if using canned) to help blending. Return to your soy sauce in a pot, add the fruit mixture, chili flakes, sugar and other sauce ingredients. Add more water or pineapple juice if you prefer thinner consistency. 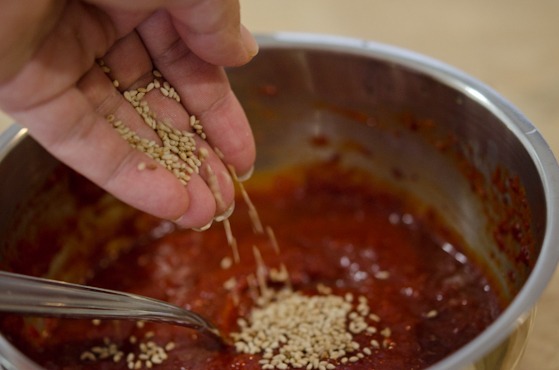 Don’t forget to sprinkle some of my love.., the toasted sesame seeds. 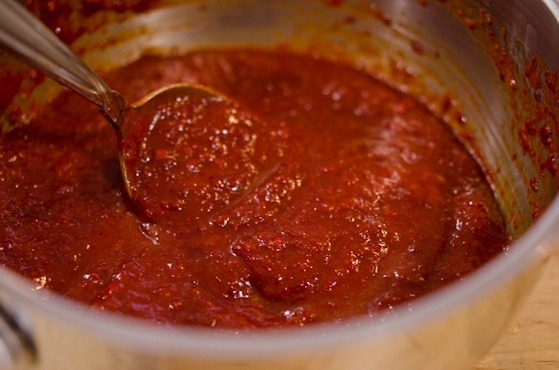 Now transfer the sauce in a container and chill in the fridge for at least 3 hours to mature. 1-2 days will be more desirable. This sauce can last in the fridge for couple of month. 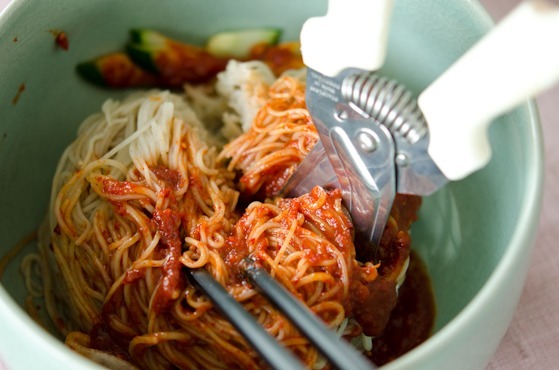 You can use it to any type of noodles, or even use in spicy Korean vegetable salads. 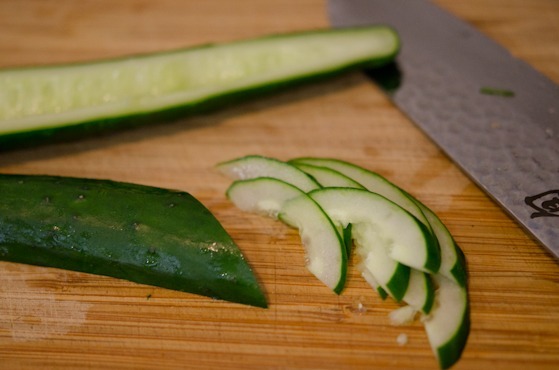 I made cucumber salad with this sauce and it tasted awesome. Let’s move on to make quick topping for our noodles. 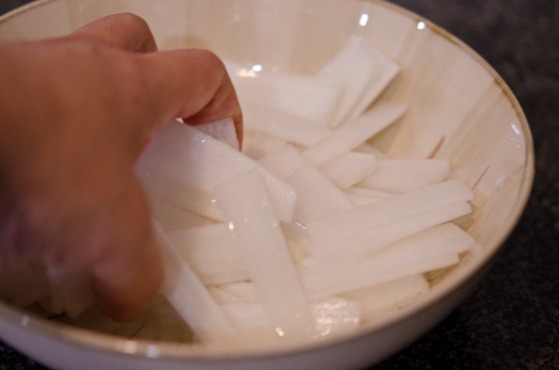 Add 1 tbsp salt, 2 tbsp sugar, 2 tbsp vinegar to the radish slices and toss well. Set aside for 20-30 minutes to wilt. 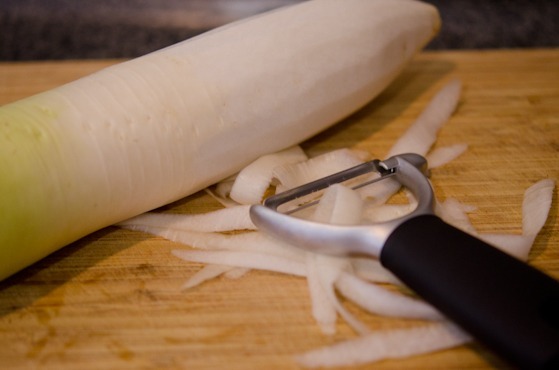 We are making a quick radish pickle. and squeeze out gently to remove the water. Set aside. 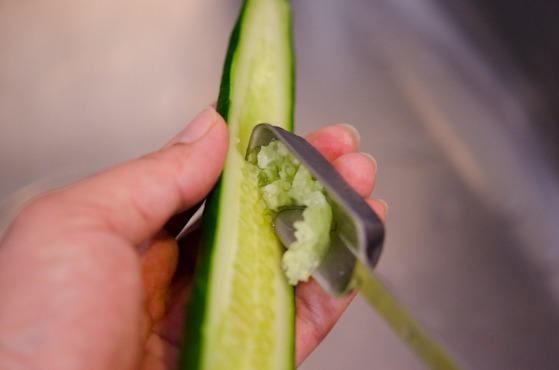 Cut a cucumber in half lengthwise and scrape off the seeds in the center with a spoon. Slice diagonally about 1/8″ thin. Set aside. Boil water and add the Naengmyeon noodles. Cook for 4 minutes or follow the package direction for the cooking time. You will see the water becomes very cloudy. You want to stir the noodles often so that they don’t stick together. Rinse your noodles in the cold water. Ice water is even better. Rinse until you don’t see any more starch water coming out from the noodles. 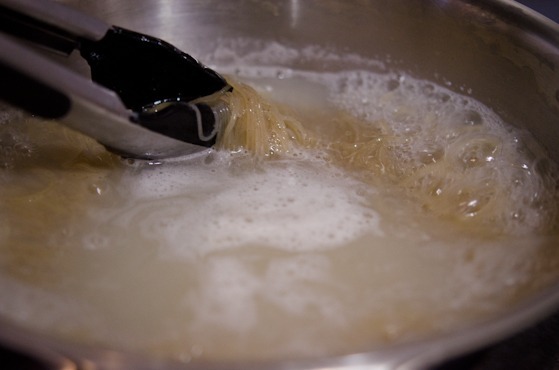 Place noodles in a large bowl and top with sauce, about 2-3 tablespoonful. Top with the radish, cucumber, and boiled egg sliced in half. To eat, just mix well. But in order to mix well, this is what we do in Korea. 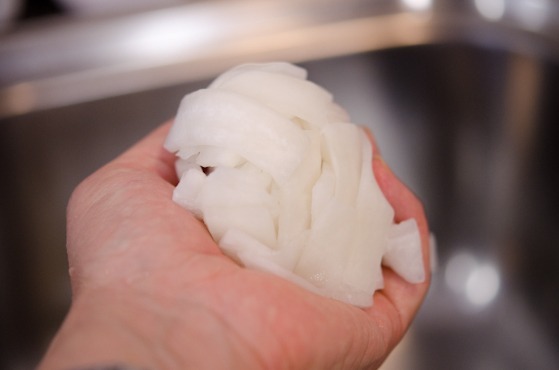 Cut noodles 2-3 times with a pair of scissor. That way it is easy to mix and won’t choke you with a long strand of noodle as you eat. Some people like to add couple of ice cubes in a bowl to keep the noodles cold. But it can dilute the sauce as you eat. Beat the summer heat with the heat; So spicy hot that you will forget how hot it is outside. Hope your summer is going as fun as it can be. To make the sauce, combine 1/2 cup water and soy sauce in a pan and bring to boil. Remove from heat and set aside to cool. 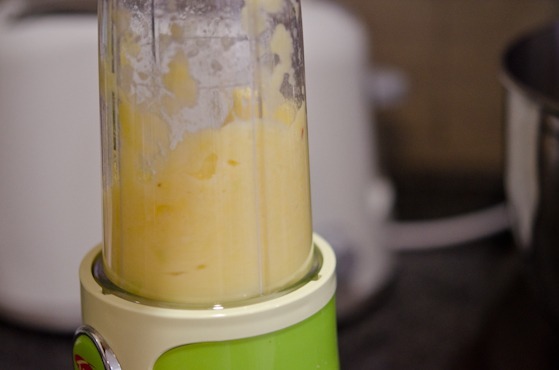 In a blender combine apple, onion, pineapple and garlic, add the 3 tablespoon water or pineapple juice (if using canned pineapple) puree until smooth. Return to the soy sauce in a pan, add the fruit puree and the rest of the sauce ingredients. Mix well. Add a little more water if you prefer your sauce thinner. Transfer to a airtight container and chill in the fridge for 1 day before using. 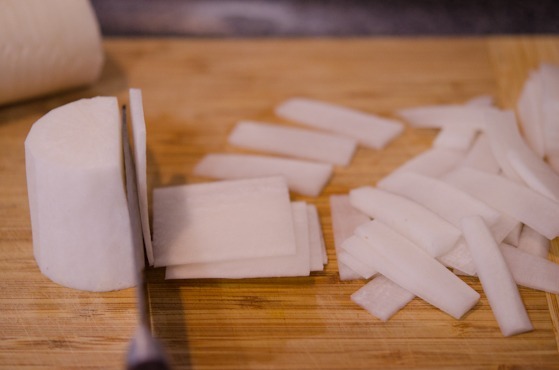 For the topping, toss the radish strips with salt, sugar and vinegar and set aside for 20 minutes. Rinse and squeeze out extra moisture. 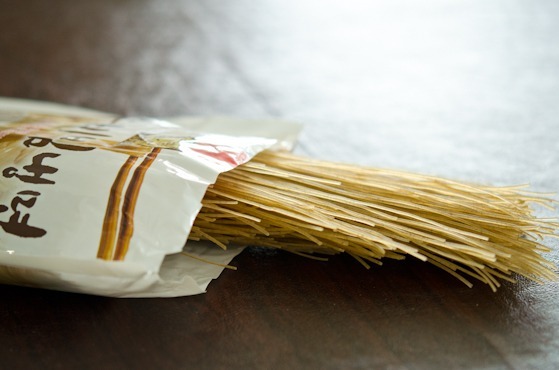 To cook noodles, boil water in a pot and add noodles and cook according to package directions. Stir often so they don't stick together. 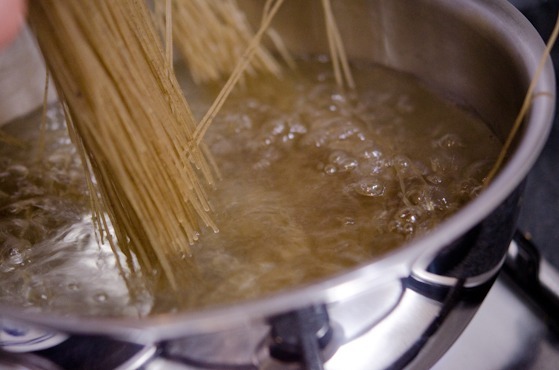 Drain and rinse the noodles with very cold water. 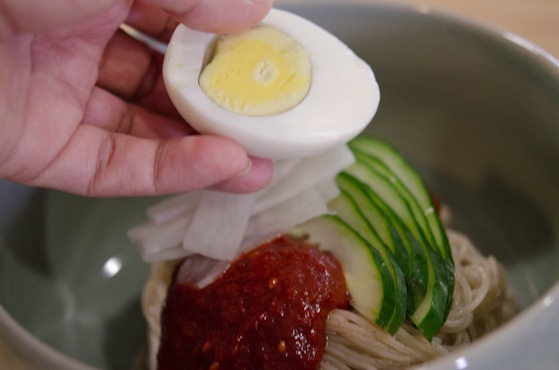 To serve, place desired amount of noodles in a large bowl and top with 2-3 tablespoonful of sauce, place cucumber and radish slices on top, and top with boiled egg half. Cut noodles with a pair of scissor 2-3 times and mix well with sauce and toppings. Enjoy. 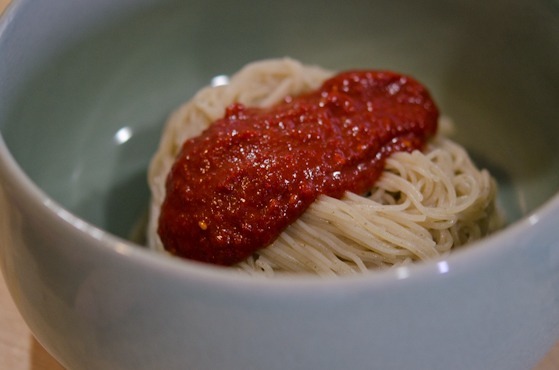 I tried this once and simply loved the texture of the noodle and the ultra spicy sauce :) Certainly a great dish for a place like Malaysia where its summer all year round. Thanks for the recipe Holly! I hope you had great vacation. Hi swan, good to hear from you. Of course I believe any Malaysian can handle the spicy Korean sauce. Just perfect match! Yes, Korean food is my favorite too. Thanks for stopping by! I love this! I was never a big fan of nengmyon when I lived in Korea but now I love it! Funny how my appetite changes overtime! This looks fabulous. Believe me, my appetite changes every day. 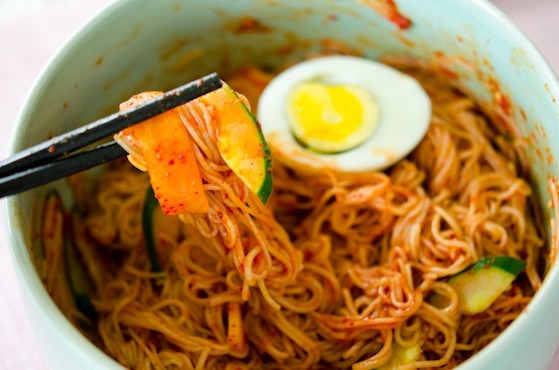 Naengmyeon is great dish to turn up the lost appetite. Thanks Mabel. 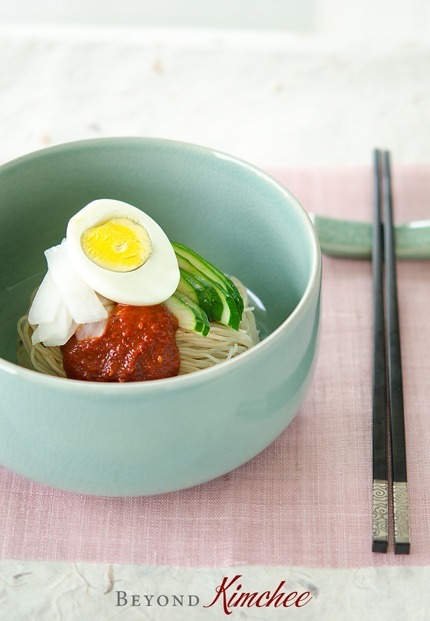 I guarantee this spicy Naengmyeon will beat your summer heat. Tastes far much better than the package kind. Welcome home! I love this recipe -- so unusual and exotic, but still somehow comfort food. And pineapple is a surprise ingredient! I can't wait to try this. Thanks Ann. Pineapple adds nice flavor to the sauce without tasting any. Hope you can give this a try. I am visiting where I grew up right now. .Funny how it used to be home and great place to visit, but Florida is home now. I love your step by step your photos.are great!..I so want to try this...I might have to ease up on the heat a bit though. Welcome back! Sounds like you had a great vacation. But no matter how much fun a vacation is, I, too, always enjoy returning home. Particularly if I have a dish like this to look forward to! What a great recipe. I love pasta and I love spicy, so this sounds wonderful. Great flavors, and pretty easy to make - what could be better? This looks fantastic! I can't wait to try it! I love Beyond Kimchee!! Keep up the great work!! That sauce sounds amazing! I'm definitely going to make it once I get my hands on some pineapple! I love the chewy texture of the noodles. This looks wonderful! Lovely pics, as always, and a great recipe. I'll definitely be trying this! 한국전통음식을 소개하면서 소바라고 설명하는 것은 부적절하다고 봅니다. 냉면은 이북지방 고유 음식이고 일본소바와 얼마나 관련이 있는지는 의문입니다. 영문판 위키에서 냉면을 검색해봐도 소바라는 단어는 보이지 않습니다. 삭제 또는 정정 부탁드립니다. 의견 감사합니다. 그렇군요, 소바는 일본말이라 냉면으로 표현하기는 적절하지않군요. 정정하겠습니다. Can you use gochu jang as well for the sauce? You can, but I highly recommend to use the chili powder instead. Paste will bring different texture to the sauce. How do you get the noodles to be chewy? I've tried doing as you said with rinsing in ice water but it never comes out as chewy as when I get them at restaurant. Do I let it sit in the fridge? Also the noodles tend to clump up. How do I keep it from sticking together? Hey! Your recipe looks absolutely yummy~ I will try making it very soon! The sauce must be made one or two days before being eaten right? Should we keep it in the fridge after making it? Thanks! Yes, keep the sauce in the fridge. Had this for supper and it was delicious! Great recipe. Hi Bee The sachet might be the sauce that comes with the noodles. But I am curious why it is light orange in color. Usually complimentary sauce in the package for this noodle is usually deep in red color. Have you checked the expiration date? 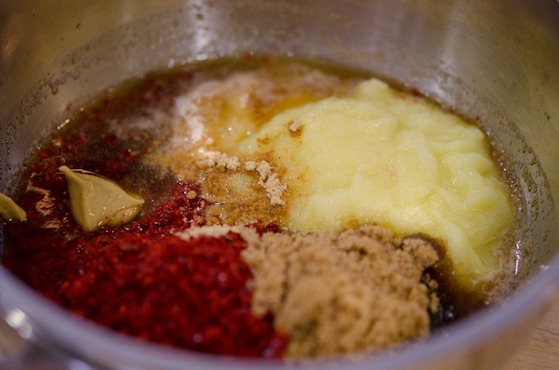 The reddish powder might be the mild chili powder that you can sprinkle directly over your 어묵soup. Taste it fist to see if it is edible to make sure, though. :) Glad to hear that you got some Korean cooking going on! Happy eating! Yes, I checked the date and it is fine. If I decifer the looking like handwritten letters correctly the name of the liquid should be 냉면 용 육수. I will try the powder by sprinkling it on the Eomuk and you'll here from my self-experiment in case I survive it, OK? Thank you! Loved the recipe! My fiancé wants the cold ice soup broth to mix with it. Would you mind sharing the recipe for that as well? I'm having trouble finding a recipe he likes it paired with.